Hello beautiful people. How was the weekend? I have been a little down for two days and yesterday I jacked up (in Frank Donga’s voice). Well, when it comes to food, I am ever ready at your service. So, this is my first food post and its Fried rice all the way. First, I parboiled rice then used a sieve to drain out the water and wash. I cooked and fried chicken and beef. Made the vegetable sauce with green peas, carrot, spring onions and pepper along with beef (all diced), curry and bouillon cubes. Left to simmer for 15mins then added rice with sauce little by little in a separate pot till the entire content is mixed in the sauce(used a wooden spoon). I left it to cook for 20mins. Food is ready to be served. Note: This is my recipe. Really sorry I’ve got limited pictures. 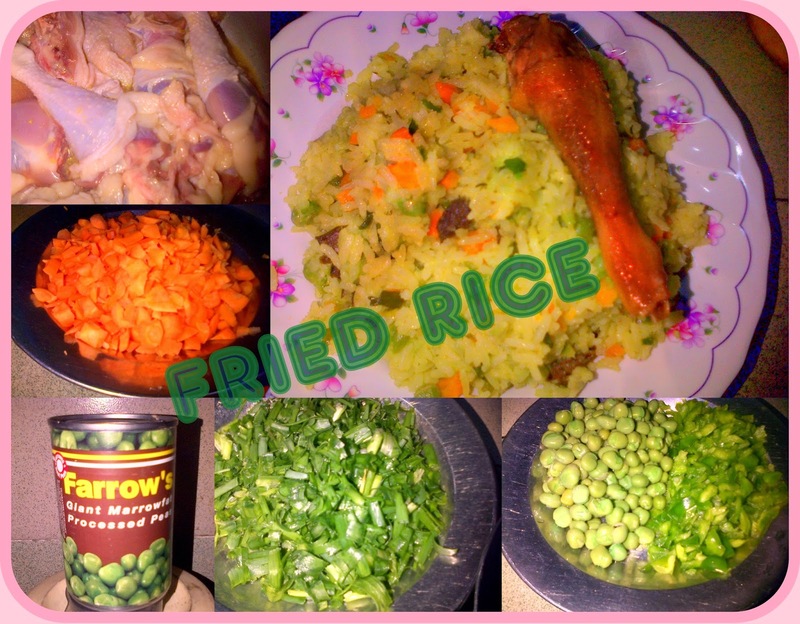 Nice post … Diced kidney + shrimps, cabbage and white onion are great comdiments for fried rice. Nice .. You missed out on cabbage. Shrimps + diced kidney is a good addition too.